Note: The Living history Center has been replaced with the American Revolution Center. We have not yet updated this website. 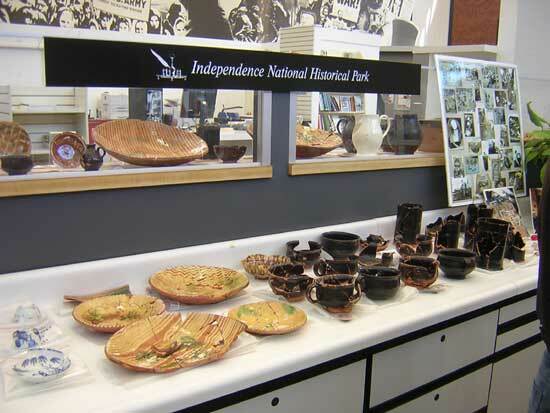 A visit to the Independence Living History Center Archaeology Laboratory is a feast of shards, bones, and broken glass. And a live archaeologist to explain what you're looking at. Two recent archaeological excavations in Philadelphia were news nationally and internationally. The first took place at the site where the National Constitution Center now stands. Imagine a busy neighborhood of free African-Americans, Quaker merchants, recent immigrants, and many others living out their ordinary — and occasionally extraordinary — lives during the early years of Philadelphia and the formative years of the burgeoning nation. The second was at the President's House, where Washington and Adams conducted the affairs of state, and where Oney Judge and Hercules took care of the Presidential mansion before fleeing to freedom. They and seven other enslaved Africans lived at this house, which was the "White House" for 10 years, from 1790-1800. Archaeology at the House uncovered foundations of the kitchen, of the bow window Washington had built, and an underground passageway, used primarily by the slaves and servants there. Watch archaeologists study the real artifacts from the digs as they analyze everything from tiny seeds and animal bones, to glass bottles and ceramic fragments, and learn how archaeologists use these objects as clues to the untold stories of the past. Where else can you learn about the cultural traditions of free African-Americans through dinner leftovers, the Enlightenment through children's toys, a prehistoric campsite in the middle of center city, and the ins and outs of urban life in the eighteenth and nineteenth centuries through household trash? The laboratory presents a behind-the-scenes view of the work conducted by archaeologists and the public is invited to join as Philadelphia's buried history is revealed piece by piece. This building was formerly Independence National Historical Park's visitor center. The bell in the tower here, cast at Whitechapel Foundry, was a gift to the people of the United States in 1976 from Queen Elizabeth. This building now houses the American Revolution Center.